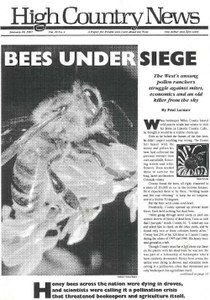 Honeybees across the West - and the nation - are dying in huge numbers, and some think a pesticide, methyl parathion, may be the primary killer. Gary Nabhan of the Arizona-Sonora Desert Museum believes the "forgotten pollinators" - native bees and other insects - have been ignored too long in favor of the non-native honeybees most people are familiar with. Leonard Felix, in his own words, defends the safety record of the pesticides he and others aerially spray. Beekeeper Miles County, in his own words, explains why he thinks a pesticide is killing his hive. Beekeeper Tom Theobald pushes hard to get federal and state officials to address bee kills he is convinced are caused by the pesticide Penncap-M.
"Grassroots Grants: An Activist's Guide to Proposal Writing" by Andy Robinson offers a wealth of useful advice. Quotes from Andy Robinson's book, "Grassroots Grants: An Activist's Guide to Proposal Writing." The Cowboy Poetry Gathering is back Jan. 25-Feb. 1. The 17th annual Rivers Festival takes place Feb. 7-9 at Fort Mason Center in San Francisco. Colorado State Senate seeks volunteer student interns for its regular session Jan. 8 through May 7. Santa Fe's Forest Trust will hold six public meetings Jan. 18 to Feb. 16 in Arizona, New Mexico, Colorado and Utah. The 100th National Mining Conference and Exhibition will be held Feb. 2-5. Yodeling saves lives in Oregon floods; mystery train in Nebraska; dog crap in Aspen; "Blue Mountain Paranoia" in Blanding, Utah; English girl saved from Vail ski lift. Board meeting and potluck in Socorro, N.M.; HCN's growing pains and direct mail; winter intern Danielle Desruisseaux; in other news; thank you, Ginnie Newsom. The FAA's new rules for overflights at Grand Canyon will not ease the noise problem at all, critics say. Environmentalists and Native Americans object to a proposed Park Service management plan that would develop bike and horse trails in New Mexico's Petroglyph National Monument. A Colorado judge rules that hunters can sue the state for using money collected from taxes on hunters and fishermen to purchase land near Rifle for a prison site. Higher entrance fees at Yellowstone won't necessarily keep the park open, because the money needs to go to repair roads and buildings, park officials warn. In stark contrast to the revolutionary zeal that opened the 104th Congress two years ago, the 105th Congress begins quietly.